Scored and folded my red textured cardstock to create my easel structure. 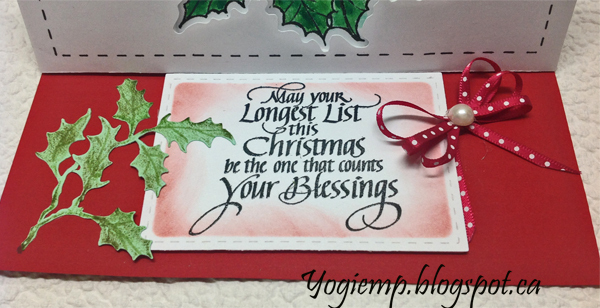 Cut another piece in white the same size as card and adhered to front. 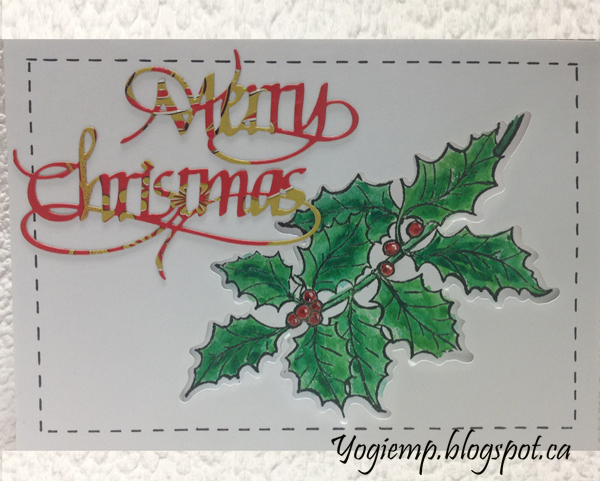 Stamped the holly (Sheena Douglas "Holly" set) on white cardstock using Versafine Black Onyx and clear embossed. Painted with watercolors. Electronically cut the upper layer in the same orientation as the bottom layer. Cut a piece of fun foam and adhered to the top layer then onto the bottom layer, then onto the card front. Doodled some faux stitching using a black Zig marker. Die cut the "Merry Christmas" from an Oriental Menu that was mailed to me. I was about to throw it out, but said to myself, it's a nice glossy heavy weight cardstock with really nice food images... I love the way the die cuts turned out. It was a 6page menu so have lots of die cuts BIG GRIN. Added some white dots to the berries with a gel pen ad then Glossy Accents. On the floor: Stamped the quote using the black and clear embossed. 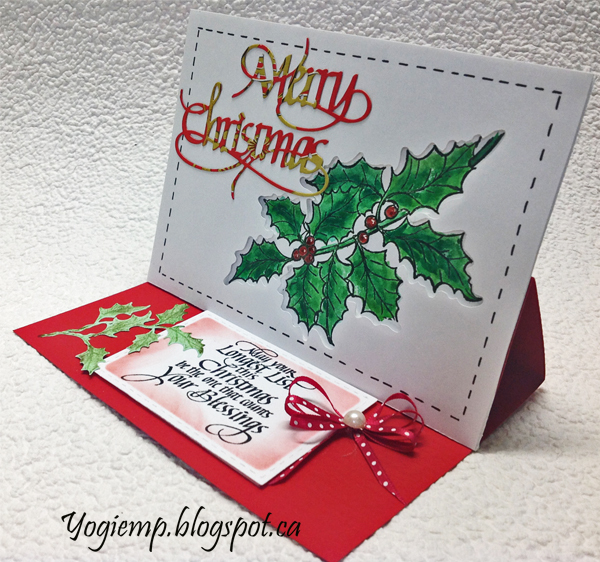 Die cut with Elizabeth Craft Designs "Stitched Rectangles", sponged edges with Distress "Candied Apple". Adhered to some mat board and then to the floor to act as my stopper. 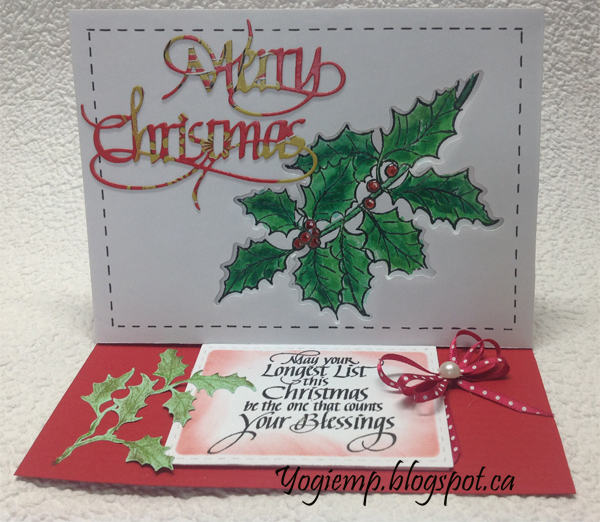 Die cut the holly sprig (Tim's thinlits "Holiday Greens"). 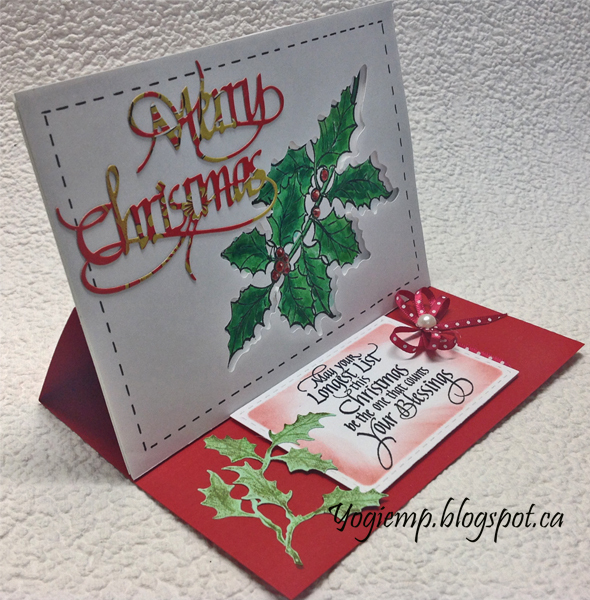 Colored with Distress pads. Tied a multi loop bow and adhered with hot glue. Added the large white pearl. or And More Gallery for other hand made greeting cards please click the link below.